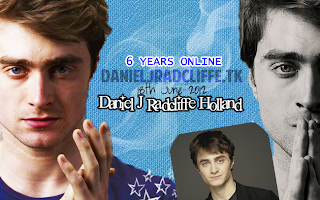 Home » site » DJR Holland is 6 years online! Today, 18th June 2012, danieljradcliffe.tk has turned 6. I can't believe it is already 6 years later since I first started this site, and it has grown so much since the start (and it still does). I look forward to hit 10 years online. I am glad that visitors let me know how much they appreciate the site. So I would like to thank all the visitors for the great support! But then also I should not forget our partners/affiliates + everyone who provided news/contacted DJR.tk in the past years. But then I also shall not forget Daniel himself ofcourse. without him, no site. I am working on new stuff regarding the site, so there's more to come! If you want to stay up-to-date with what I am working on regarding the website "like" our Facebook page & follow our Twitter. Thanks. Then I also have some news for you all today..
article: DreadCentral: "Daniel Radcliffe back for TWIB part 2? UK fans can buy the DVD/Blu-ray of The Woman in Black today! Marion congratulations on the 6th birthday of the web!!!!!! I hope there are more to come! hi..even am live in UK still your web that i always visit to know how's Dan doing. and even its really rare for me to write down a comment in your web but this time i just want you to know that am really appreciate all your effort to gather Dan's news..its brilliant to have you in this past 6 years. thanks a lot for your kind message! I'm always happy when I read such a lovely comment :) those are the reason I keep doing what I do :P well apart from the fact that I like to do it too, (and to support Dan at the same time) thanks!